The health benefits of soybean oil include its ability to improve your heart health, lower your cholesterol, improve your immune system, reduce cognitive disorders, prevent osteoporosis, and improve growth, while also boosting eye and skin health. Soyabean oil is a vegetable oil that is extracted from soybeans, which are scientifically known as Glycine max. It is one of the most widely used vegetable oils in the world, possibly because soybeans are some of the most widely cultivated and utilized plants, particularly in recent decades. Soybean is native to East Asia and is considered a legume, however, despite its limited origin; it is highly prized for its edibility. Most soybean oil is refined, blended, and sometimes hydrogenated and it can be graded into different levels and strengths depending on the desired application. Soybean oil is considered healthier than most other vegetable oils, due to the presence of a good variety of essential fatty acids in it, which the body needs in order to remain healthy. There are also a number of plant sterols in soybean oil, which can have a wide variety of health benefits on people who regularly include soybean oil in their diet. The vitamin and mineral content of soybean is what gives this delicious and widely useful legume its fame. Soybean oil has many health benefits, let’s take a closer look at them. Soybean oil can seriously decrease your chances of getting atherosclerosis and other heart conditions, such as heart attacks and strokes. As mentioned above, the good balance of fatty acids contained in soybean oil means that the body can get the important and necessary fatty acids in their diet, including those which regulate cholesterol levels. Omega-3 fatty acids can reduce dangerous cholesterol levels and counteract the negative types. Furthermore, the other fatty acids like stearic acid, palmitic acid, and oleic acid are also found in balanced quantities. The fatty acid composition of soybean oil, as well as the powerful plant sterols, such as β-sitosterol, can actually cause a reduction in cholesterol storage in the gut by 10-15% – not what you normally expect to hear from a ‘fatty’ acid! Another important function of vitamin K is its osteotrophic potential, which means that it can stimulate the regrowth or promote healing of bones. While this is often associated with calcium, vitamin K (which soybeans have in plenty) can also stimulate bone development in a very positive way. Therefore, make sure you switch to soybean oil if you want to prevent certain conditions like osteoporosis, which is often a natural result of the aging process. Omega-3 fatty acids, which make up to 7% of the total fatty acid content in soybean oil helps to protect the cell membranes. This includes the very fragile and dangerous areas of the skin and eyes, both of which are common entrance points for bacteria and other foreign materials. The omega-3s also promote better vision by acting as antioxidants and neutralizing free radicals that can cause macular degeneration and cataracts. The high vitamin E content in soybean oil also acts as a powerful antioxidant while similarly protecting the skin from damage caused by free radicals. Vitamin E is directly associated with improving the appearance of blemishes, reducing acne scarring, protecting the skin against sunburn, and stimulating the regrowth of new skin cells to promote healing. Vitamin E is also associated with general antioxidant activity in the rest of the body, which boosts the immune system and helps to eliminate free radicals that cause certain conditions like cancer, premature aging, cognitive disorders, and heart diseases. Remember, it may be a healthier form of vegetable oil, but it is still somewhat high in omega-6 fatty acids. Although, ‘essential’, it is still a problem if it is not evenly balanced. There are still calories involved if you are worried about obesity. 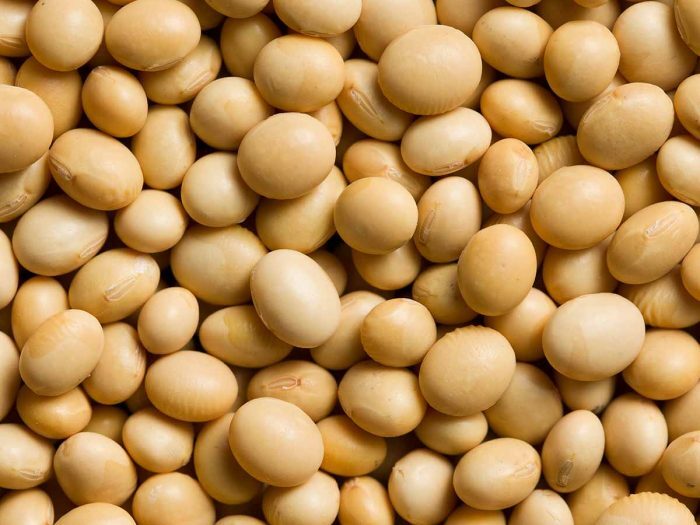 Furthermore, soybeans are closely related to peanuts, so with the increasing numbers of peanut allergies around the world, be careful with soybean oil. Besides that, enjoy and happy cooking! Average rating 3.9 out of 5.0 based on 184 user(s).